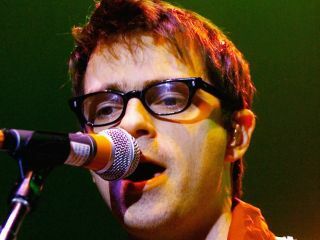 Weezer frontman Rivers Cuomo has been hospitalized after suffering minor injuries in a tour bus accident early Sunday (6 December) morning. According to CNN, Cuomo's bus was on the New York State Thruway around 40 miles west of Albany en route from Toronto, Ontario, to Boston, Massachusetts for a show scheduled for today at the Agganis Arena at Boston University. The bus driver reported that, after a light snowstorm, the rear of the vehicle slipped on ice, ran into several reflective road posts and jumped a guardrail, ultimately landing in a ditch. Cuomo was brought to St Mary's Hospital in Amsterdam, New York, complaining of rib pain, along with his assistant, Sarah Kim. The singer's wife, Kyoko, their two-year-old daughter, and a fifth passenger were also riding on the bus but were uninjured. Weezer's Boston show has been cancelled, along with two other concerts, 9 December in Washington DC and 10 December in Camden, New Jersey. The status of other dates is unknown at this time. MusicRadar wishes Cuomo a speedy recovery.